Previous Occupation: She was a Professor of Law at Rutgers U. School of Law from 1963-1972, and Columbia Law School from 1972-80. In 1971, she was instrumental in launching the Women' s Rights Project of the ACLU, and served as the ACLU' s General Counsel from 1973-1980. Previous Office: She was appointed a Judge of the United States Court of Appeals for the District of Columbia Circuit in 1980. President Clinton nominated her as an Associate Justice of the Supreme Court, and she took her seat August 10, 1993. Education: She received her B.A. from Cornell University, attended Harvard Law School, and received her LL.B. from Columbia Law School. Spouse: She married Martin D. Ginsburg in 1954, and has a daughter, Jane, and a son, James. 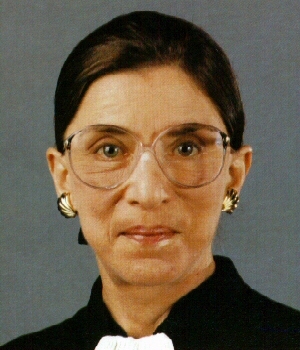 Click here for The Forum discussion on Ruth Bader Ginsburg.